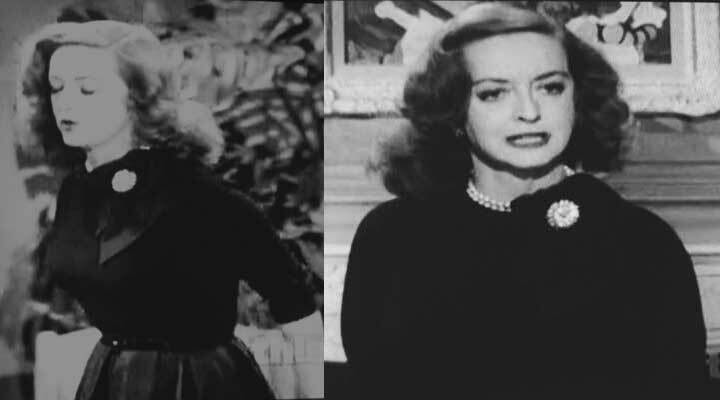 In this movie, Margo (Betty Davis) is an aging actress trying to hold on to her youth, career, and boyfriend. In the process, she takes in Eve Harrington, a starstruck wren of a fan, as a live-in assistant of sorts. Eve insinuates herself into all facets of Margo’s life, in sort of a SWF kind of way, though slightly less sinister. Female drama and grief abound. The clothes pretty much tell the story, so if you want to watch the movie and be surprised, don’t read any further. 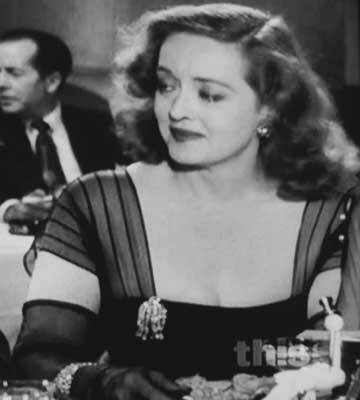 All About Eve won 6 Oscars (including Best Costume Design, Black and White) and was nominated for 8 others. This is also Marilyn Monroe’s first credited movie appearance and she looks (and sounds) divine even in her limited role. What I love most is that there is a wide range of fashion inspiration here- we see evening gowns, cocktail dresses, stage wear, and casual clothing as well- both for men and women. Karen is the wife of Lloyd, who is the playwright currently dedicating his career to writing for Margo. She’s a good wife, and also best friend to Margo. As she’s coming to the theater one night after the play, she encounters Eve, who habitually stands outside the theater after each of Margo’s shows. This time, Karen invites Eve in, discovers her Margo obsession, and offers to foster an introduction. Karen’s dress is deceptively simple- high standing collar with no lapels, V neck, princess seams, and relatively relaxed fit. As was typical for the era, the dress buttons down the back, all the way down to the waistline. The stand-out detail here is the contrasting sash that starts somewhere on the inside of the bodice, then waterfalls down one hip; and it looks like her collar (if not the entire bodice) is lined in that same fabric. "What a story! Everything but the bloodhounds snappin' at her rear end." Upon introduction, Margo invites Eve to share her life story. It is a woe-ridden tale of working in a brewery, losing her husband, and following her dreams (Margo) from San Francisco to New York. Eve has a soft, lovely voice, and her story even has its very own soundtrack: a soft, mournful symphony, all of which brings tears to nearly everyone’s eyes. Seeing that Eve must be nearing the end of her rope, Margo takes her in, gives her a place to stay and work to do. As the perfect assistant, Eve has some great outfits, hand-me-downs from Margo. My favorite is the second look there- a light blouse with white cuffs and collar, and a high-waisted dark wiggle skirt and black patent belt. I wish this was my daily uniform, and I think everyone’s life story should have its own symphony. Eve plans a party for Margo and Bill, who is Margo’s boyfriend and director. Right about now Margo is realizing that Eve is just the tiniest bit too good to be true, so she’s on a diva-rampage through most of the evening. Thankfully, she looks divine in this dress. And I realize that I’m like your one friend or sister who manages to always take your picture after you’ve just put something in your mouth, but I needed that back shot so you could see how her sleeves work- they’re basically completely detached, so you can see bits of skin as she moves around. She’s also sporting a really pretty diamond brooch and some diamond cufflinks at her elbows as well. One detail that’s hard to see- her cuffs and pockets have fur trim. Mixed with the diamonds, it’s a beautiful look. "Nothing is forever in the Theatre. Whatever it is, it's here, it flares up, burns hot and then its gone." Everyone who is anyone comes to this party, including Karen, of course. I love that she’s the prototype for Real Housewives of New York, and she looks fabulous all the time. 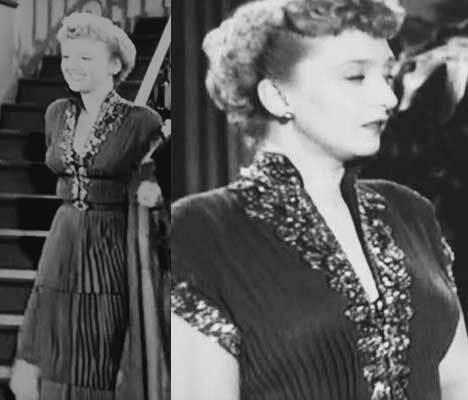 Her cocktail dress is dreamy- multi-tiered pleated chiffon with extensive beading around the collar, sleeves, and neckline. I can’t decide what the real-life color of the dress is (you know how you can just sort of tell what the color is supposed to be in black and white?) but I’m hoping it’s either blue or purple. "A column? I'm not even worth a paragraph." Eve is also there, of course. She looks innocent and demure in a simple black dress with super-wide shoulders and a tightly fitted bodice. The details of the dress are outstanding though- the shoulders of her dress point up, and her mid-length sleeves echo that same angle. 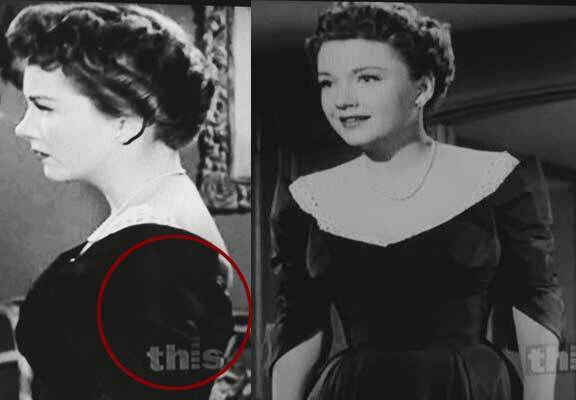 There is also a tiny underlining of white lace (venice lace, I think) visible under the bodice. The best detail, which is unfortunately the least clear, is the buttoning down the back of her sleeves (circled in red). That may have to be my next experiment, because it’s so pretty and unique. "While you wait you can read my column. It'll make minutes fly like hours." Things essentially start to fall apart between Karen, Margo, and Eve right around then. Eve gets herself made Margo’s understudy without Margo knowing; Karen pranks Margo by making her miss a performance, so Eve gets to go on; mysteriously, a number of critics are invited to the performance to witness Eve’s debut; Eve builds an unholy alliance with one of those critics and alienates everyone who had befriended her. The day after this performance, Karen goes to meet Margo for lunch wearing this sharp-looking suit. 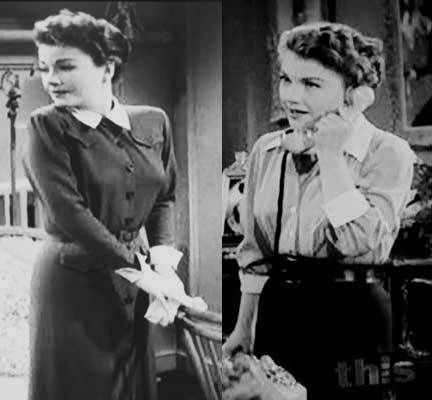 The neckline and collar are fabulous- high standing collar (again), this time with single lapels that aren’t too wide, but do have very nice contrast stitching as a border (carried through on her cuffs as well); the neckline is rectangular, rather than V-shaped, and set off by a long strand of pearls that she’s both wrapped and tied-off. 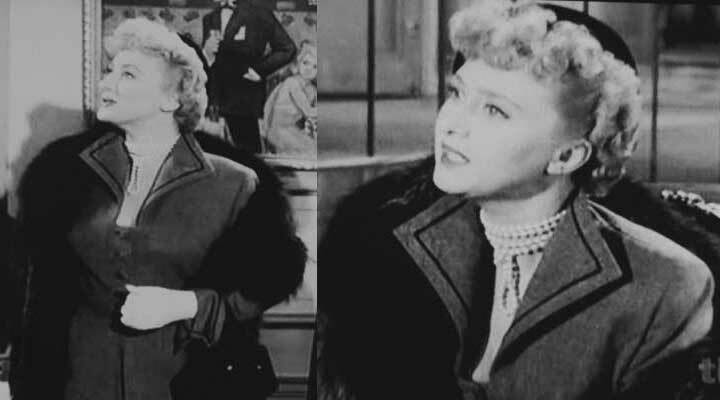 If you went out and bought yourself a super long strand of pearls after seeing Rita sport a similar look in Lady from Shanghai, you’re all set for this too. "Infants act as I do. They carry on and misbehave. They would get drunk if they knew how to." While waiting for Margo, Karen reads the incendiary article about Eve’s performance and runs over to Margo’s apartment so stop her from going out and share the article. More diva outrage ensues. Margo storms around her place, blasting Eve and her pet critic. While doing so, she’s wearing a simple black sweater and a skirt with these huge pleats- like 3″ wide pleats, at least. The best part is her enormous flower/bow anchored to her collar with a smaller floral brooch. It’s really sweet and pretty, a startling contrast to Margo herself. "That's one career all females have in common, whether we like it or not: being a woman. Sooner or later, we've got to work at it." Finally, the outrage dies down and Margo and Bill join Karen and Lloyd for a quiet dinner out on the town. Margo has finally accepted Bill’s proposal and they are excited to share the news (my favorite is that whenever Margo addresses Bill, she always starts with “Groom…”, instead of his name or some other endearment). 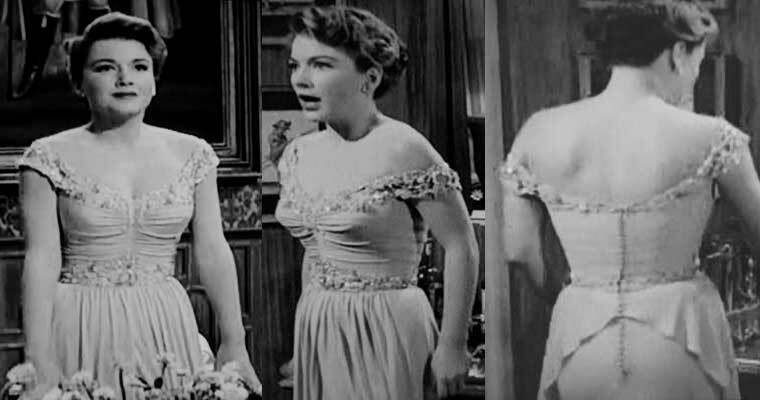 Finally, it looks as though Margo has matured beyond her infantile tantrums, and she is wearing what I assume is a dress, with these very pretty sheer, striped cap sleeves and a brooch she has worn throughout the movie. Her gloves are also sheer. "When you're a secretary in a brewery, it's pretty hard to make-believe you're anything else. Everything is beer." Unfortunately, Eve is at the same restaurant, dining with her critic. She sends a note to Karen, begging for a conversation in the ladies room. We assume Eve wishes to apologize for the horrid things she is quoted as saying in the article, and the conversation more or less goes on as expected, but also with some blackmail thrown in (of course). Eve wears this as her abject apology dress- again choosing clothes that emphasize her sweetness and harmlessness. Scallops all over her neckline and sleeves, and sheer fabric gathered from the neckline into a little choker of a collar with a bow. And, of course, the run of buttons down the back- hard to see, but they are there. "The cynicism you refer to, I acquired the day I discovered I was different from little boys!" Karen listens to her apology and is even briefly suckered in by Eve’s undying sincerity. 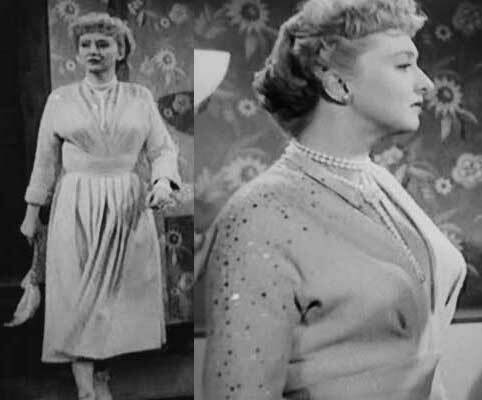 She does it wearing what looks like a sequined knit stunner of a dinner dress. It has a deep V neckline with darts that gather down to a wide contoured waistband and a pleated skirt. She looks like such a dowd in these pictures, but the dress is so, so pretty. She’s wearing her same pearl necklace as before, but wrapped fewer times, and tied into a longer lariat. At the end of the day, there is a testy truce between all interested parties, Margo and Bill are happy; Karen and Lloyd are happy; Eve gets almost all she wants. Lloyd’s next play goes to Eve as the headliner, and she wins a presitigious theater award (the Sarah Siddons award) for her work. The headline picture is Karen’s dress for the award ceremony- gorgeous lace all over; Eve is wearing this pretty thing- again with the wide shoulders; this time with a ruched bodice, beading, gathered skirt with a little peplum in the back.